Lean Station had a very successful event at the JTC partner's night on 16/Oct in Singapore where it showcased many of it's new innovative tools and additions to the Lean PlanDo. Lean Station announces the launch of Lean PlandDo insights - a data analytics and insights module that provides actionable info curated to enhance the implementation and to measure the effectiveness of the adaptation of Lean PlanDo in a construction project. Lean Station will be allowing incremental access to all existing users of Lean PlanDo to the Lean PlanDo insights without any extra charges. It will be bundled with the Lean PlanDo package at no extra charge for the upcoming new users of Lean PlanDo until a commercial model for this module will be worked out. Lean Station also unveiled a thoughtful communique called the the "the golden spiral of LEAN" highlighting some of the key transitions a company and even an individual will go through to become more productive and profitable. It was designed as a simple communication symbol that identifies with the digital construction innovations of Lean PlanDo and benefits it has to offer. Lean Station thanks the support of JTC in promoting Lean construction and directing the construction industry in Singapore to be Lean and productive. Lean Station exhibited at BuildTech Asia 2016 tradeshow from 18-20 Oct at the Singapore EXPO Hall 3. Lean Station was at the Infocomm Media Development Authority (IMDA) Singapore Pavillon to demonstrate innovations in lean construction and showcase Lean PlanDo, a collective plan and control methodology and cloud based application. At BuildTech Asia 2016, the Infocomm Media Development Authority (IMDA) is one of six government agencies that will be showcasing smart technology solutions to empower SMEs in the construction sector to achieve greater competitiveness. In partnership with BCA to bring smart technology to the built environment sector, IMDA will feature Lean Station’s lean construction planning tool for workforce and project management. These solutions are mapped to the workflow of construction companies so that SMEs’ workforce can readily use them in daily operations. BuildTech Asia offered a great platform for connecting innovation with potential users and Lean Station is thankful to the collaboration and support from Infocomm Media Development Authority (IMDA) and Building Construction Authority (BCA) to help propagate the value to the industry in Singapore. Lean Station's started as a spinoff out of NUS and its core comprises of construction knowhow + technology + lean expertise. This fuels our mission to make our customers thrive. 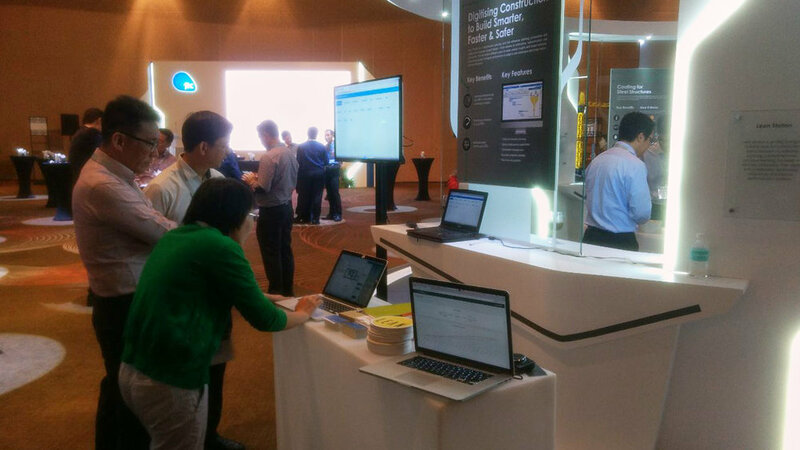 Lean Station is incorporated in Singapore in 2015 and we work with customers and partners across the world. Lean PlanDo was developed in collaboration with A*STAR, NUS and many construction companies who helped in identifying existing construction challenges, validating assumptions and for providing test-beds. Prof David Chua, one of the co-founders of LeanStation, spoke about lean+safety on 20th September 2016, at the Samsung C&T Safety Seminar event titled "Family-First Safety-First Event" organized by Samsung C&T at Suntec Convention Hall, Level 3. Lean Station also exhibited some of its tools at the event. Lean PlanDo was one of the highlights at the event demonstrating how lean methods can help companies make construction projects safer and with improved productivity. The talk and the exhibition was intended to create awareness of lean construction principles and recent advances in the area of planning and project management that impact safety of construction projects and how such web and cloud based tools improves the adoption and increase collaboration between the project teams. Lean Station is researching and building tools to solve the chronic issues plaguing construction projects like reduction of wastes. .